As hard as I try to only plan 1 brunch per month for the Boston Brunchers, it just doesn’t seem to happen. I am actually happy if I can cap it at 2 brunches! So when December rolled around, I just bit the bullet and declared a Weekend of Brunches! Saturday’s brunch found us in that little traveled patch of Mass Ave between Harvard Square and Porter Square at Temple Bar. Every time I drive this patch of road I think that I need to stop and check out some of the fabulous stores and restaurants. Thanks to brunch at Temple Bar, I can now cross that off my list…not to say I won’t do it again, this is a great stretch of shopping/eating! But now for the real point of this post…brunch! 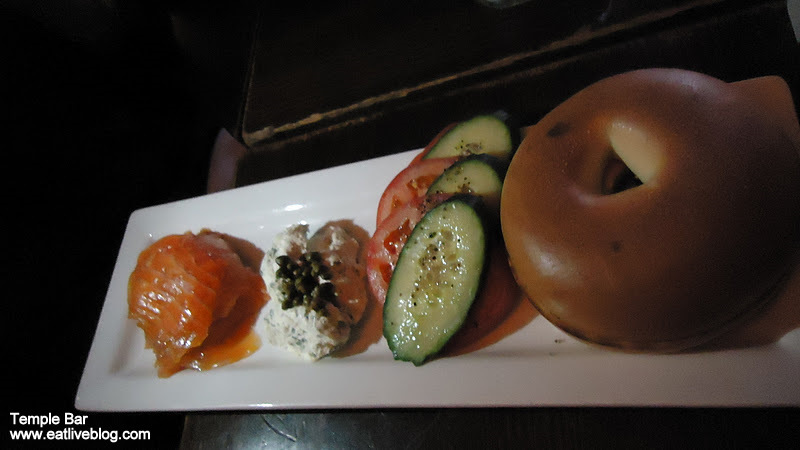 Temple Bar was generous enough to offer us our choice of menu items, coffee, a beverage of our choice, and dessert! The menu had a great selection of both breakfast and lunch items, which is a good thing for a brunch! It was a tough choice between the Cheddar Bacon Breakfast Sandwich, the Cobb Salad, and the Steak and Eggs. Amanda and Rachel, who were on either side of me, went with the sandwich, so I went for the steak and eggs. Let me back up. When we arrived at Temple Bar, we were greeted with a plate of the most moist banana bread I have ever eaten, the only thing missing were chocolate chips. The banana bread was accompanied by some chocolate muffins that paled in comparison next to the heavenly bread. We also had coffee, which was mild and pleasant, and NEVER got cold thanks to constant “toppers” from the attentive staff….and we were a party of 16, so this is no small feat. Ok, back to my main course. The steak was perfectly medium rare, and the egg was perfectly over easy. The potatoes were fried, but still mushy, which I liked. The onions in the potatoes were fantastic…I picked them all out. We also shared a side of the crispest, saltiest, most delicious bacon. I tried a couple bites of the Biscuit Sandwich, and it was amazing!! Amazing! It had a great balance of sweet and salty. This would be my recommended dish when you head to Temple Bar, it was really unique and memorable. I also tried the house cured pastrami, which was outstanding as well. It had a great smoky taste you don’t find too often. 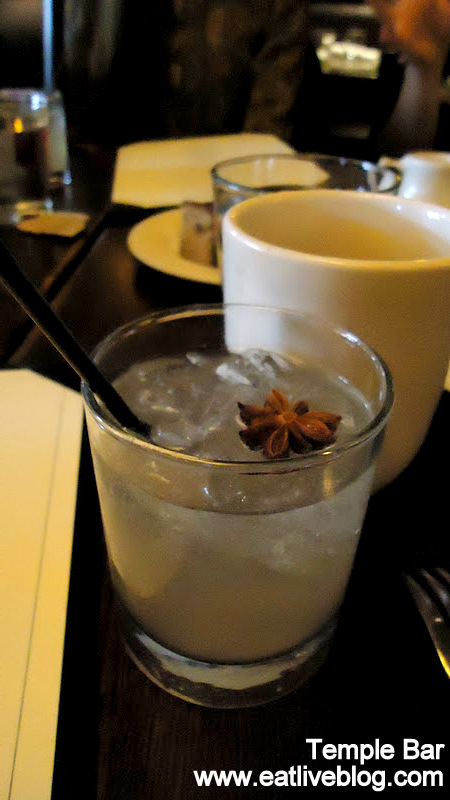 Bloggers Punch – Specially concocted for the Boston Brunchers! At this point I was completely stuffed…but Temple Bar didn’t care! They went ahead and brought out 4 different types of desserts for us to try! There was a pumpkin mousse, a chocolate brioche bread pudding, creme brûlée and a cranberry cake of some sort. Every single one was delicious, and each blogger picked a different favorite. 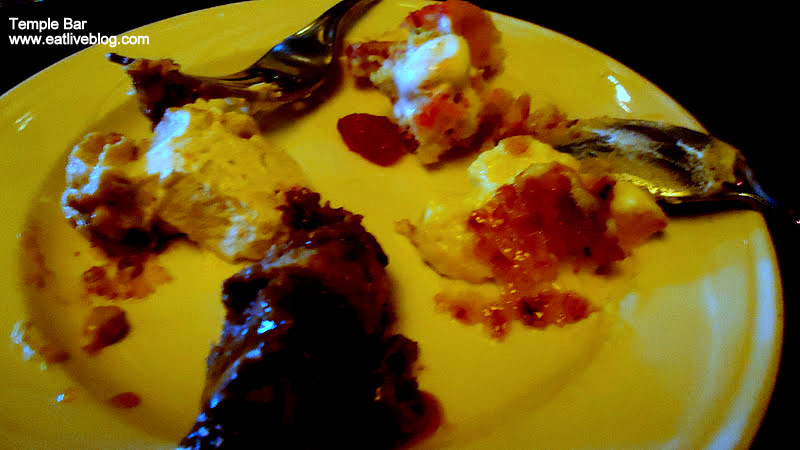 My favorite was either the bread pudding or the cranberry cake, it’s hard to choose! A bite of each dessert! Although the brunch was delicious, I have to say the best part of brunch was the conversation. 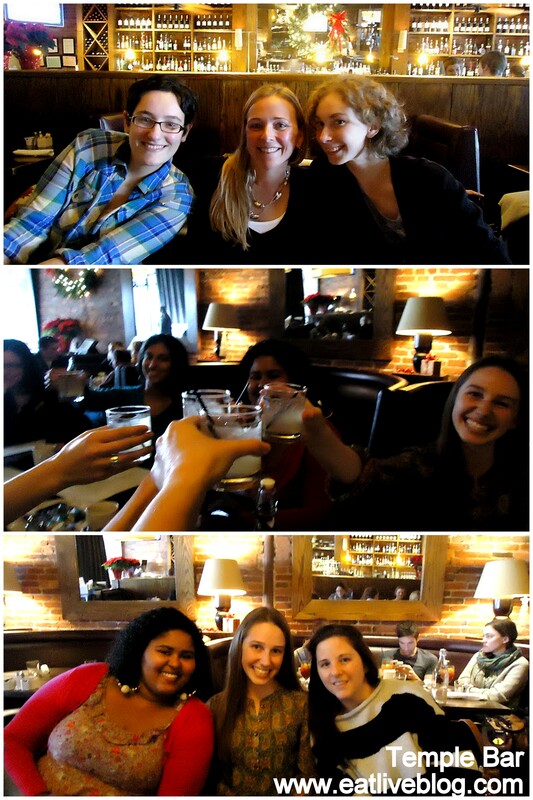 It was so nice to catch up with some of my favorite bloggers and some amazing “new to the Brunchers” bloggers. But, I give Temple Bar all of the credit for bringing us together and giving us an amazing meal to catch up over! Disclaimer: Brunch was provided to the Boston Brunchers free of charge. We were only responsible for the gratuity. As always, all opinions are my own. 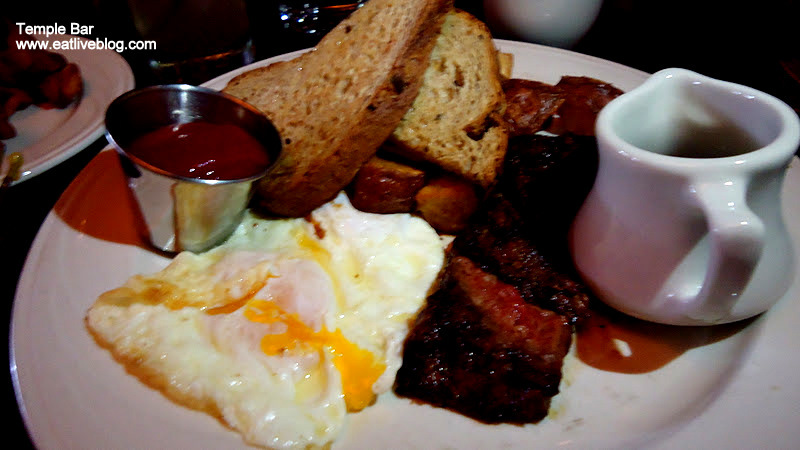 This entry was posted in Reviews, Travel in New England and tagged blog, boston, Brunch, cambridge, restaurant, review, temple bar by reneeh. Bookmark the permalink. The food looks great and I’m sure it tasted that much better being shared with good friends. 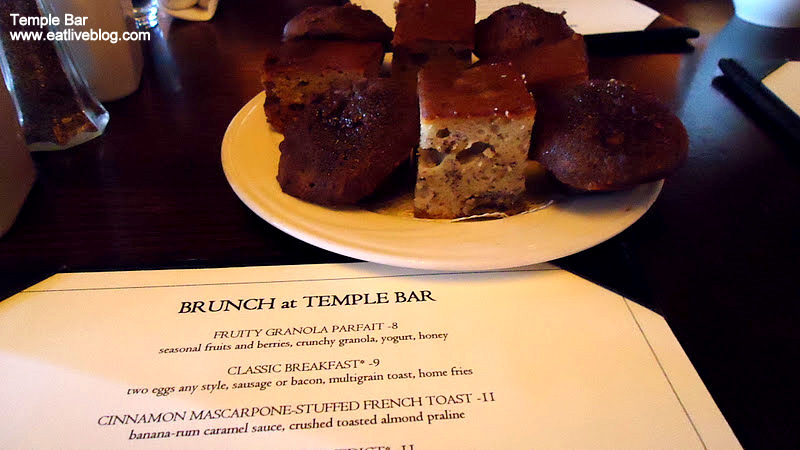 I’ve never had brunch at Temple Bar but it looks like you had a great time! I’m sorry to have missed it! Loved it! And would love to go back!